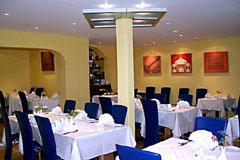 Jholpai restaurant has been serving the communities in West-Byfleet and all the surrounding areas since 2002.The management prides itself in having built an excellent reputation for serving you with quality cuisine of the Indian Sub-Continent. We are passionate about providing you with the highest quality and the most delicious authentic dishes. Awarded food hygiene rating " 5" very good by Woking Borough Council. The Jholpai management & staff are proud of this achievement.we will always endevaur to keep the rating at this level. Open every day noon-2.30pm and 6-11.30pm. All major credit cards accepted (not Amex/Diners). No service charge. Traditional cuisine created in a contemporary manner and served in contemporary surroundings by our courteous and friendly staff. The food was excellent and the service swift. I thoroughly enjoyed my visit and will be coming again!